Make your card your gift. 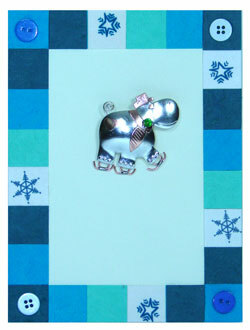 Each card of recycled or handmade paper is adorned with a hand-crafted pin. A gift your friend or loved one will treasure. This card is blank inside and comes with a matching peel-and-seal envelope. The card weighs two ounces and is nonmachinable. Made for Hippo Mojo by Pilgrim Imports, a company committed to non-exploitation. All artisans and workers are making a living wage in a culturally sustainable environment.